It’s a wild crazy Turkey, trying to make his getaway, running as fast as he can! 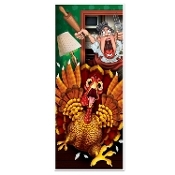 New hysterically funny classic holiday bird decor, shows this classic holiday bird going bezerk when he discovers HE is the dinner! Hilarious bathroom door cover, featuring a traditional cartoon feathered friend on the run! Makes a weird conversation starting refrigerator door cover, too! Plastic Door Cover that can be placed on bathroom wall, closet door or use as part of a Scene Setter.